Union Minister for Health & Family Welfare, J P Nadda on Saturday has assured that Nagaland will have substantial increase in quote of seats in various medical colleges of the country. The Union Minister said that the Centre would ‘seriously consider increase in quota of medical seats for Nagaland’ during a meeting with Nagaland Health Minister, S Pangnyu Phom, who called on Nadda on Saturday at his office chamber in the national capital. 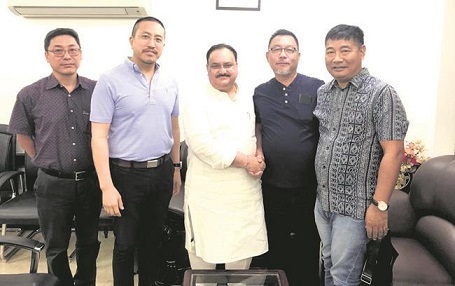 Pangnyu had impressed upon Nadda about the need for more medical seats to students from the State and also about the proposed medical college in Kohima. He justified the demand for additional medical seats on the ground that unlike most states, Nagaland has no medical college despite growing demands each year. He said that while most states in the Northeast have at least one medical institute and some having two or more, Nagaland has none. Earlier, Union MoS for Health, Ashwini Kumar Choubey had informed the Parliament that there are 479 medical colleges in the country with an intake capacity of 67,352 MBBS seats. 13,004 MBBS seats have been added in the last three years, he said. Choubey also apprised that the government is implementing a centrally-sponsored scheme for the establishment of new medical colleges attached with district/referral hospitals in 58 districts in 20 states and union territories in the country.